I’ve always believed that fishing has the potential to help young people understand more about the environment, science and other core school subjects. That’s why three years ago took the opportunity at Smithills School to give our students the chance to experience its many benefits. The school was fortunate enough to have a fishery on the boundary of the school grounds, managed by Bolton Angling Association. Using money raised from rod licence sales, the Environment Agency installed a safe access path and fishing area. With seven members of staff becoming professionally qualified angling coaches through the Angling Trust, the school set up the Smithills Angling Club and was on its way to adding angling to the curriculum. The club meets weekly during term time and has a school-based angling team that competes with other local clubs at weekends. Angling has become part of our learning outside the classroom and every pupil as the opportunity to take part. It promotes a connection with nature and the real world, away from TV, video games and social media. I have found that pupils to learn a lot about their environment, the water cycle, importance of water and weather patterns, and the effect humans can have on all of these. Whilst being a fun and interactive activity angling is great at helping people overcome the challenges of everyday life. Stress is common place in today’s society and children are just as badly affected by it as adults are, this is where the interaction with nature, each other and being in the fresh air can help break up the day. In addition to the curriculum angling can tie in well with other subjects. Fishing can be linked to maths, giving pupils a practical understanding of measuring water depths and of buoyancy, using weights to balance floats. In Science they gain a good, hands-on, understanding of common plants and animals, and of photosynthesis. Angling is a fantastically absorbing pastime that gets the students out in the fresh air, close to nature and provides a constant reward for a focused, patient approach to over coming lives challenges. I’m told that Smithills is the only school offering angling activities to its students, but with a little thought and planning there is no reason why other schools can’t develop a similar programme of activities. If you're planning to go fishing make sure you have a valid rod licence, you can purchase one here, and remember under 12 can fish for free! Alec Cottrill is head teacher at Smithills School, Bolton. He is also a passionate angler. Can you think of any other activity where a 12 year old has to be licenced? It's 17 to drive a car,16 for a motorbike, 18 to vote, 16 to marry with parental consent but a school child of 12 needs a licence to catch a perch! It's about time the EA raised the age for a licence to at least 16. 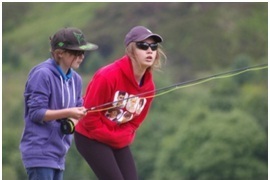 I agree with K Checkley, 12 is too young to be hold a rod licence. I suggest that 16 is more than an acceptable age to take responsibility for your own pass time and it's also an age when young people can start to earn their own money. Please EA, use your wisdom and encourage participation by relaxing the licencing requirements for young people, so the next generation can take up a past time that has given many so much pleasure for so long. Good morning, Thank you for your blog, I hope the following response answers you comments: We at the Environment Agency did not introduce a rod licence for under 16s. Junior licences were part of the licence structure of the 10 Regional Water Authorities that were combined to form the National Rivers Authority in 1989. One RWA even had a licence for under 10s. Juniors were required to buy the concessionary licence at usually half the cost of a full licence. I agree with what Paul is saying. Lots of us would like to take our children and grandchildren fishing but you all know youngsters can change and it is then a waist of money. surely we should be able to let youngsters try it for a few times before we have to buy them a licence? I believe paying for a rod licence helps teach children about paying your way in life, not everything is free or a hand out. want to find out how to get my school involved.. I agree with charging a fee at the age of 12. We are talking £5.00 for a year which is nothing. I also think this fishing in schools is fantastic and only wish I had the opportunity to do it as a child.